U21 Championship. 12th round. October 22, 2016. Dolynska. Kolos stadium. Att: 200. 5 oC. The league leaders Shakhtar arrived on a visit to Zirka without two top scorers: Mykyta Adamenko is ill, and Andrii Boriachuk is preparing with the first team for tomorrow's clash between the senior teams. Thus, Roman Yalovenko took the center-forward position, with Ihor Kiryukhantsev playing as a left midfielder, and with Mykyta Bezuhlyi operating at right back. As early as on 4 minutes, the Donetsk team could earn a spot kick: Zirka defender brought down Danylo Ihnatenko in the penalty area, but the referee paid no attention to the episode. Almost the entire first half of the match was spent by the Pitmen on adapting to the heavy field in Dolynska. 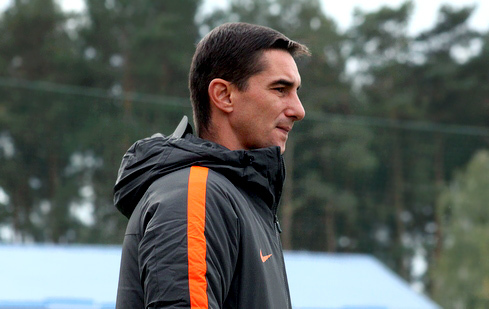 The condition of the pitch nullified Shakhtar’s advantages in pace and technique, not allowing the visitors play their habitually fast, combinational football. The Pitmen created their first dangerous chance near Zirka goal only after thirty minutes of the game: Giorgi Arabidze cut inside from the right flank and powerfully struck into the near corner – the goalkeeper stopped the ball. Ihnatenko might excel immediately afterwards, but Zirka defender prevented him from properly hitting the ball. Meanwhile, the hosts did not even think of coming out of their half, having all the players defending their own goal. Operating in a compact and organized way, they managed to concede no goals in the first half. After the break, the game did not change at all, with Shakhtar players only starting attacking more aggressively, trying to make their attacks more versatile. The long-range shots by Arabidze were still dangerous. In one of the episodes, the Georgian picked up the ball in his half, dribbled it to the opposing penalty area and shot on goal from some 25 metres – the goalkeeper parried the attempt away with difficulty, with no Pitmen being there in time to finish it off. Unsuccessful were the attempts of the whole to score from set play. The Orange-and-Blacks had the most realistic chance to open the scoring ten minutes away from time. Yalovenko and Kiryukhantsev played a quick combination, with the latter crossing it into the penalty area, but Yuriy Hlushchuk struck it over the bar from the goalline. 0-0 – Shakhtar failed to beat Zirka away. In the next round, on October 28, the charges of Valeriy Kryventsov will entertain Chornomorets Odesa in Schaslyve. - It is difficult to play good combinational football on the kind of pitch we’ve had today. I have never commented on the pitch condition, but in this game, this factor strongly influenced the result. Virtually the entire game, we were struggling with a heavy field, which nullified our superiority in the speed and movement. It was impossible to give an elementary pass, because the ball changed direction three or four times before reaching our players. However, this does not in any way excuse us. Even under these conditions, we spent both halves on the opposing half of the pitch and created a lot of good chances. The team, who set an objective of claiming the league title, must score at least one goal. Unfortunately, we failed to do so. It's a shame that we lost two points, but sometimes it happens. At the same time we are pleased with the desire and commitment of the players, all the guys have tried their best, and we prised them for that. The league season continues, we must claim our lot in the following games.